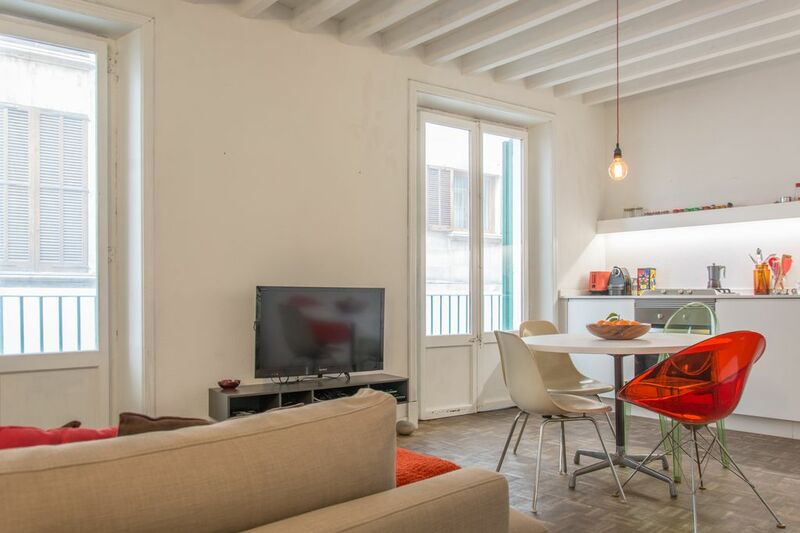 The flat is located in casco antiguo, off from Las Ramblas. Want to feel a part of quaint, historic Palma and be in the center of all the culture? This apartment's front door opens onto the flower-tree-lined pedestrian walkway of Las Ramblas. Best of the old world with modern ammenities! Perfect location to enjoy the best bars, restaurants, galleries, nightclubs, food markets, and so on from the old town of Majorca. Apartamento ubicado en el centro de Palma, fácilmente accesible a todos los lugares. El propietario muy atento y amable. El piso esta muy bien ubicado y decorado con muy buen gusto, pero debería mejorar algunas cosas para un mejor confort. Pasamos mucho calor y es ruidoso, no solo por la calle sino también los vecinos. El baño es una miniatura, demasiado pequeño para mi gusto, y en los dormitorios vendría bien algún tipo de ropero para poder colocar la ropa. Muchas gracias por los comentarios, muy constructivos! Passar bäst för två par! Trevligt läge mitt i gamla stan med nära till allt! Lagom för egen frukost eller lättare lunch! Obs! Två dubbelsängar som ej kan separeras med ett gemensamt täcke/rum! Med den bedste beliggenhed i Palma var rammerne skabt til et dejligt nytårsophold. Lejligheden er hyggelig og særdeles velfungerende til 4 voksne. Alt i alt en rigtig god oplevelse, som vi gerne gentager. Prima onderhouden, klein maar compleet appartement. Ontvangst door eigenaar was zeer prettig en hij was behulpzaam. Appartement was schoon, klein maar alles wat je nodig hebt is aanwezig. Ligging is super, alles binnen loopafstand. Zeker een aanrader. Jose was a great host. He met us late as our flight got in late at night, gave us all the info we needed, and was even kind enough to be flexible on check out. The apartment is well located to wander round the old part of the city.